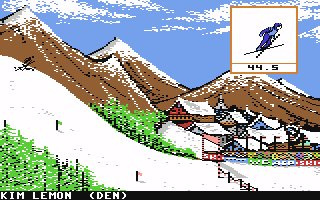 This is the winter portion of the world's foremost amateur sports competition, matching skills against the top athletes from one hundred countries. 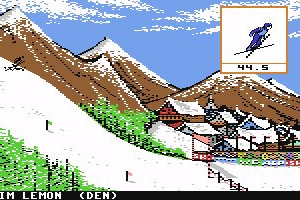 It was inevitable that after two batches of events from the summer side of the Olympic festival that the third entry in the Games series would concentrate on the winter side instead. 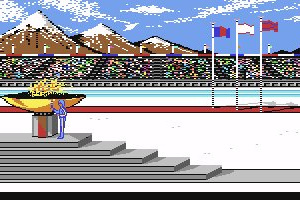 Offering seven different events, Winter Games features the ubiquitous..
You are an athlete at the Winter Games of 1988 in Calgary, about to move across snow and ice with as much speed, strength, endurance and grace as you can muster in the blustery cold. 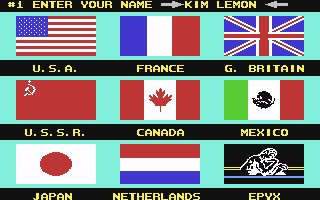 This is the winter portion of the world's foremost amateur sports competition, matching skills against the top athletes from one hundred countries. Be proud. 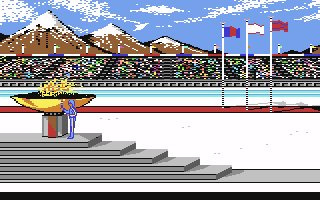 Today you stand among the elite few whose courage and stamina will be tested by these winter games. Listen. A fanfare of trumpets sound as the Winter Games flag is slowly raised. Thousands of white doves are released, symbolically to fly to the countries of the world with the message of peace and the news that the games have begun. This is it. Your chance to go for the gold! huh. this was unexpected. 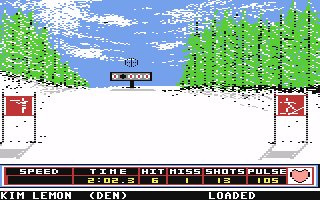 would rather have had a different C64 game, say Wizball for example. 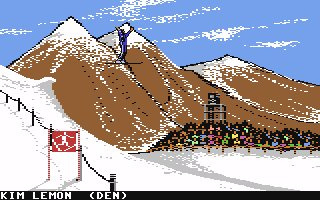 but hey, at least Winter Games is out of the way now. 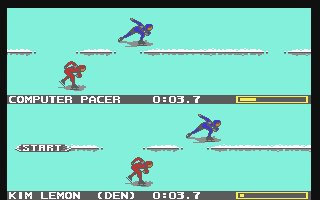 and does anyone else think this was released because of the new Mario and Sonic at the Olympic Winter Games was announced? 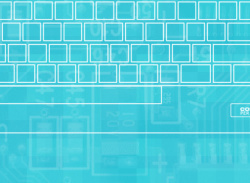 Nice review Mat, I liked how you worked a reference to Cool Runnings in there! 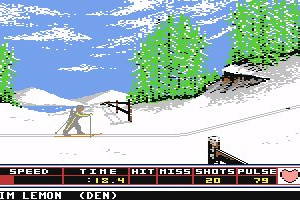 Heh, I played this one a lot as a kid on one of those early B/W PCs Great memories, although I'm not sure how it'll hold up today... Yeah, the figure skating is the weakest event, but I remember enjoying the biathlon and bobsleigh ones a lot. Hopefully they'll release Chamonix Challenge / Final Assault eventually. 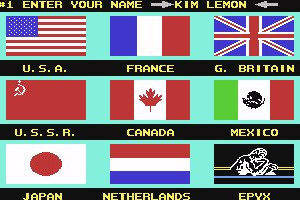 It was my favorite sport game at that time and I still consider it a very good game. Wern't these games mostly about joystick waggling? How do they translate to a D-pad? Or have the controls been remapped? 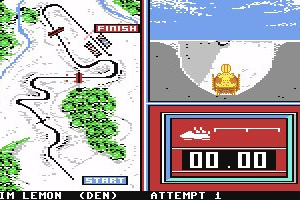 Winter Games is mostly based on timing and rhythm. There's no need to waggle the joystick like in Decathlon. 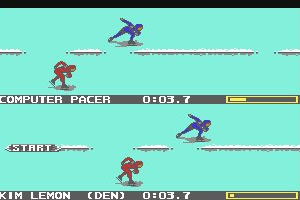 In fact, if you try to get higher speed on skating and skiing by waggling as fast as you can, the speed will be as low as possible. 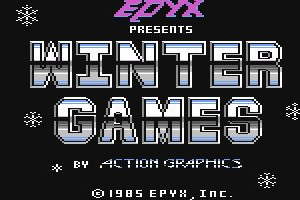 Winter Games is definetly the best of ...-Games from Epyx. Great addition to the VC. Haha sweet! This brings back memories.. 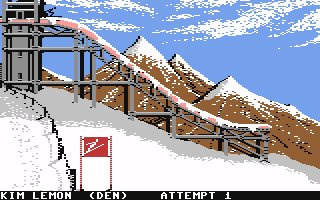 I hope there are loads more C64 games to come! Bring 'em on! 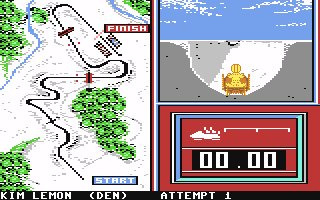 I loved this game as a kid played the Atari 800 version (this like most of the Atari 800/C64 games were identical). 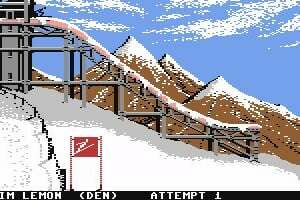 My best friend as a kid had the C64 and we played the same games on both systems) I would get this one just for nostalgia. This era of gaming lacked content and graphics, but in its day it was a WOW! 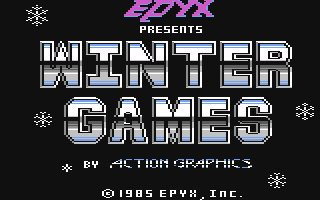 This is diffidently the best of the Epyx Games series. 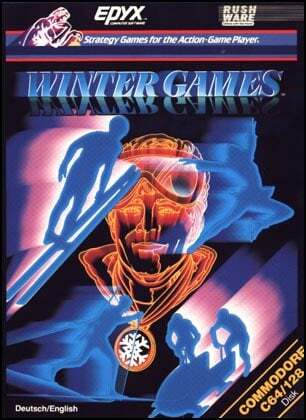 The most polished of the series (opening ceremonies to the anthems and medal ceremonies. 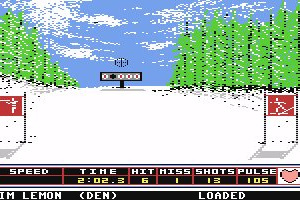 I have also played other system versions of this and the C64/Atari 800 versions were the best. Why is this not out yet in the US! 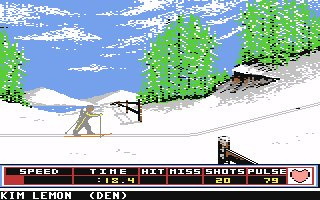 I think Nintendo of America should release this game either on February 15 or 22, 2010 to honor the Olympic Winter Games in Vancouver and as it will be almost one year since the launch of Commodore 64 games on the Virtual Console in North America.